Beautiful Incentives: Newmans Own Organics Review & Giveaway! Newmans Own Organics Review & Giveaway! I am always in search of all Organic foods and good for you ingredients. If i'm going to eat "junk food" it will have less of the junk in it and more of the actual food, with good for you ingredients, sans a lot of processed ones, with ingredients that are easy to pronounce. In the early 90's many people were really starting to dig deep into the origin of their foods and what it was made of. They became more concerned with what makes up the food than how many calories are in them. Nell Newman was one of those people and her business partner Peter Meehan. They started Newman’s Own Organics in 1993, with the notion that many people would be interested in an organic line of snacks, but they weren't prepared for how popular they were to become. It started out as a business selling pretzels and turned into a whole line of different snacks, which has now expanded into many other products, such as olive oils and beverages. Eventually they split into two different companies, Organic and non organic and they have equally flourished ever since. Newmans own organics is a brand that I can happily say I purchased from, since this review. I had a lot to try in this wonderful array of awesomeness that they bestowed upon my tummy, and have conveniently found a bunch of them at my local Publix and Target, but you can also find them online at places like Amazon. First off, the one thing I love about this company is their packaging. It's down home and old timey, which is an appealing throwback to their history. The names are even old timey and cute. Ie Ginger-o's, Newman-o's. The mint holders were my absolute favorite by far. They have really neat designs that I loving looking at and plan to use them to hold small crafting supplies once the yummy mints are finished. Don't you get excited when things are reusable? One less thing to buy in my eyes. These mint tins are cool. They scream novelty to me and I adore the art. Back to the food. Feast your eyes on this plethora of scruptiousness. 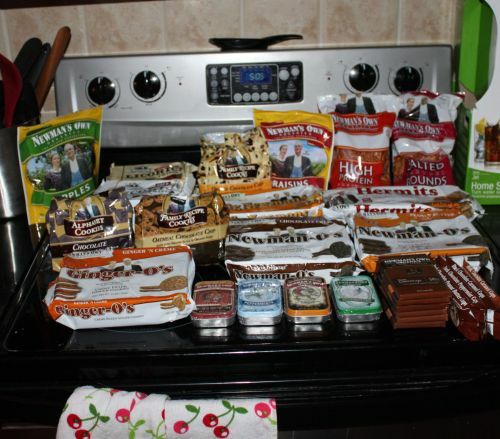 Newmans Own Organics graciously sent a variety of flavors and textures in chocolates, mints, cookies, pretzels, dried fruits, licorice and more. I was to pick 4 of my favorites out of the bunch and that was no problem, considering I loved 99% of it. The only things I didn't like were anything that head peanuts or peanut butter, as I'm not a fan of either in anything. 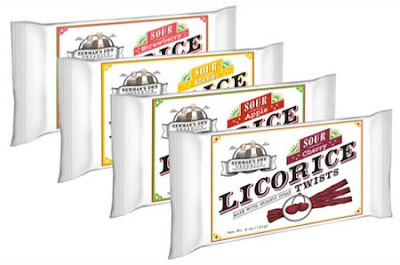 The licorice came in many different flavors and the one I enjoyed the most were strawberry and pomegranate. I also loved the sour series they have I didn't think I would, but that thought changed with one bite of their sour mango. Seriously, sour mango licorice? When do you ever see that? The licorice was nice and chewy and not hard like a lot of others. They were very flavorful and juicy as well. The High protein pretzels were very very satisfying and filling. What better way than to get some of your protein from some yummy pretzels. These were small and perfect snacking size. I took them everywhere with me in little ziplock baggies. As soon as I got hungry I would nibble on a few. They're not too plain nor too salty, just right! It's amazing just how many different kinds of pretzel Newmans has. 10 different kinds to please every picky eater and I seriously want to try them all! The dried apples were so moist and flavorful. Nothing like your average dried fruits and the best part about them was the no addition of sugars! Just pure natural sugars that come from the fruit itself. Apples seriously do not need any more sugar. I sprinkled some cinnamon over these and snacked on them. I also put them in my yogurt. They make a great desert and snack. The caramel cups were my absolute favorite of the bunch. I got to try the dark and milk chocolate variety and loved both. The inside was very moist and creamy, while the outer shell was easy to bite into and melted in my mouth. I can tell the chocolate is different from most others. It tasted more crisp, fresh and flavorful. That is probably the fact that all the ingredients are organic and whole, shy of the emulsifiers and a few others to preserve the food. I don't know, but that difference in definitely there in all of the food I have tasted. There's a reason why Newmans Own has been around so long and it shows in all the wonderful variety of foods I tasted. I think they set themselves apart from most brands with their unique packaging and better ingredients. I have since bought a lot of other products that I really enjoyed. They will definitely remain a go to for me. The goodness doesn't stop there though, they carry a wide variety for your furbabies too! If you'd like to learn more, you can visit their Facebook and keep up with promotions. And now, what you really came here for, the GIVEAWAY! The lucky winner will receive 4 of the exact same products I reviewed today and one SURPRISE item!